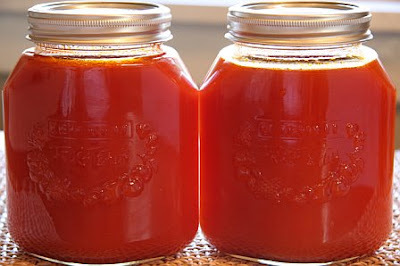 I just made a batch of this tomato soup with 5lbs of beautiful tomatoes from the farmers market. Baby #2 is due at the end of September so this will be perfect for a crisp fall day when I'm a zombie and have no energy to cook. I can pull this soup out of the freezer and enjoy it with a delicious grilled cheese sandwich. YUM! Tomatoes taste wonderful right now so it's the perfect time of year to make this soup. And it couldn't be an easier recipe. It took less than 20 minutes to prep and then a few hours to simmer (I ended up simmering for two and a half hours). I don't have a food mill so I used a fine sieve and made sure to really smash it through the strainer so I could get all the good tomato juices. Next up - more carrot lemongrass soup with fresh carrots from the market.